I want to thank Katherine Harbour, author of Thorn Jack for inviting me. Her novel is also a modern faerie tale, and one I really enjoyed. I reviewed it here, interviewed Katherine here. You can find Thorn Jack online at the usual providers: Barnes & Noble, direct from Harper Collins, Amazon, iTunes, Google, Indiebound, and Audible. My novel, The Stolen, began as a short story based on the poem “The Stolen Child” by W.B. Yeats, but with a twist. My initial backdrop was a world where all of the monsters we knew were real, but not quite as we believed. Vampires, werewolves, demons, and zombies were, in fact, faeries. The passing of time had warped our collective human memory of them into the pantheon of urban fantasy monsters that we know today. That idea didn’t last. I didn’t want to make another vampire book. I wanted something of my own. My short story’s plot was sound, but the child-stealing faeries needed some kind of transformation, and that was when I decided the key would be change. Faeries are static in most stories, never developing or growing past their mythic origins. It made sense to me that if they lived alongside humanity—which mine would, though hidden in plain sight—they’d be impacted and shaped by our influence. For example, why use magic when technology is easier and readily accessible? So, my faeries became urban faeries. They didn’t ride horses or carry bows. They drove sports cars; had guns, cell phones, and stock portfolios; and owned night clubs. For the characters in The Stolen, I knew that I wanted to keep, at least somewhat, to tradition. That meant archetypes and I settled on a wizard, a warrior, and a princess. Like my faeries though, I wanted them to be real, not stuck in idealized notions. For the warrior, I took the myth of the Fianna and brought it to the modern age. Brendan is strong and fast. But, after a living a long life of violence, he’s also scarred and haunted. It would be impossible to not be. He’s a good man, but the shadows from his past continue to haunt him. He serves a guide to the hidden world, aware equally of the wonder and the danger it presents. Now the wizard: not inept, not all-powerful, but fully, utterly human. Edward would be a stand-in for me and my fellow fantasy geeks; the answer to our wishes of being a hero in a fantasy book. Be careful what you wish for! He knows magic exists, as do all kinds of fantastical creatures, but he’s never encountered them outside a book. He quickly learns that reading about grizzly bears is one thing, standing in front of one in the wild is quite another. That meant he would need a reason not to run away screaming like a squeamish kid being chased by a bully with a slug. Enter the princess. And then forget everything you know about princesses, because Caitlin certainly isn’t one. Caitlin is a single mother whose knowledge of faeries and magic extends as far as Disney movies and the stories her immigrant grandparents told her. She can’t hurl magic or wield a sword, and she isn’t “the one” mentioned in any prophecy. Her only super power is the ability to make a little girl laugh, and give that child a good life. When Fiona is kidnapped, Caitlin has a reason to face a dark and terrifying reality, but she’s lacking in the skills to survive it. That means trusting others, which seems like a simple thing, but is it really? Even parents of a child kidnapped by a human monster must bristle at the thought of trusting the authorities to rescue their baby. And those are entities we’ve been taught to rely on in desperate situations. Trusting strangers and a friend who hasn’t been honest would be a nightmare of its own. These are my main characters. I didn’t choose just one as the main character because each of them depends on the other. With any of them missing, the story would not only fail, but so would they in their goals. I didn’t intend to write a story with multiple main characters, but those kinds of surprises are what make writing so much fun. 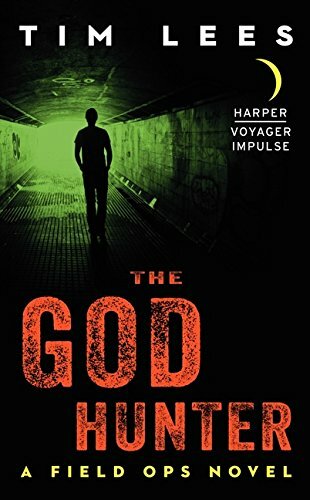 I’m inviting Tim Lees, author of The God Hunter: A Field Ops Novel. Tim is a British author now living in Chicago. He is a regular contributor to Interzone, Black Static, and other titles. He is the author of the much praised novel, “Frankenstein’s Prescription.” See more of Tim Lees here. This entry was posted in Writer's Life, Writing and tagged Blog Hop, Faerie tale, Fantasy, The Stolen, Writing by bishopoconnell. Bookmark the permalink.